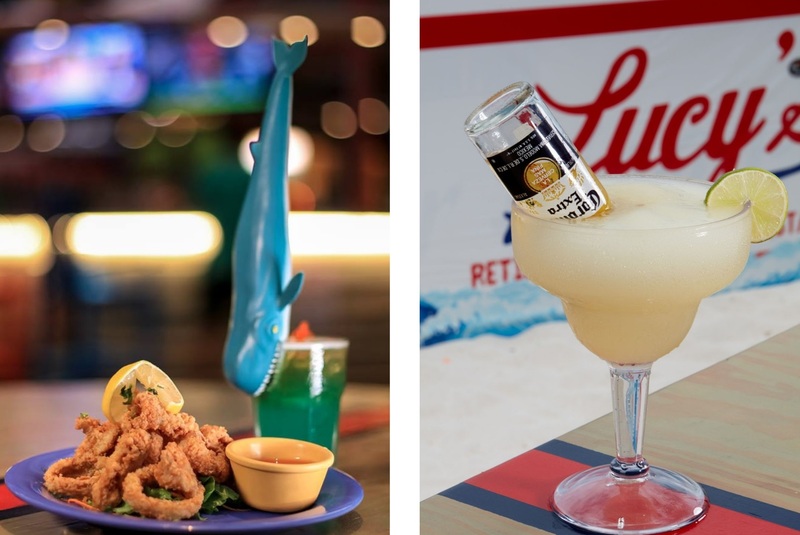 Home » About Aruba » Welcome to Lucy’s, Aruba’s New Hangout for Some Serious Fun & Grub! 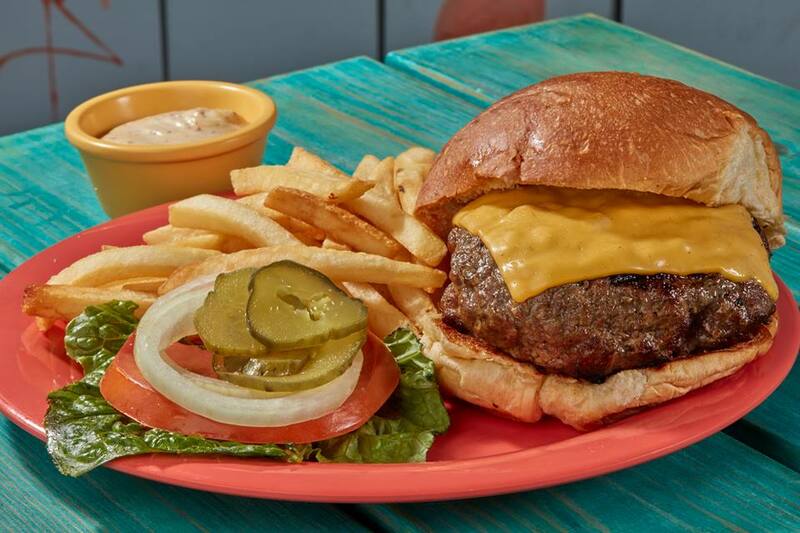 Welcome to Lucy’s, Aruba’s New Hangout for Some Serious Fun & Grub! Look no further, it is here. What you ask? 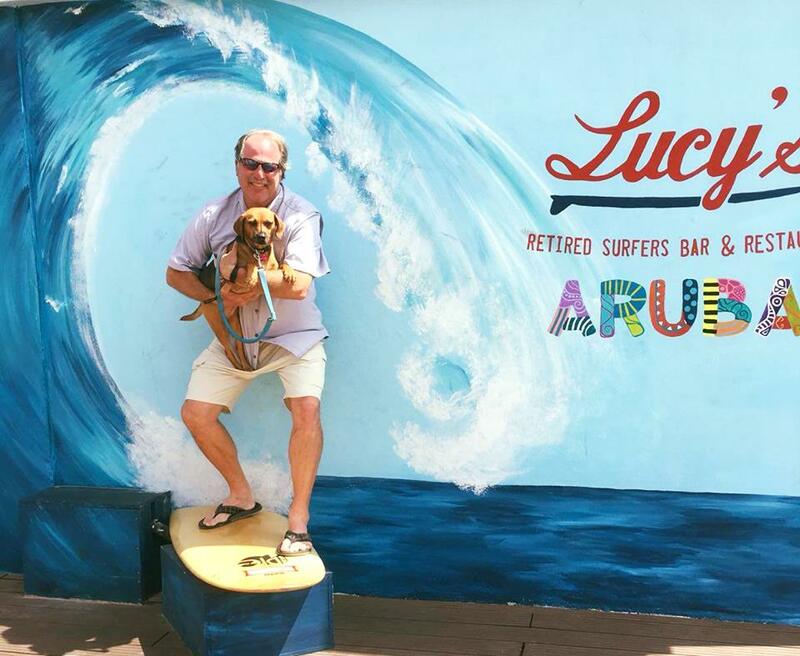 THE place to be in Aruba – Lucy’s Retired Surfers Bar & Restaurant! No, I mean it… whether you are vacationing on the island or one of Aruba’s happy locals, you will find Lucy’s has everything you’re looking for! 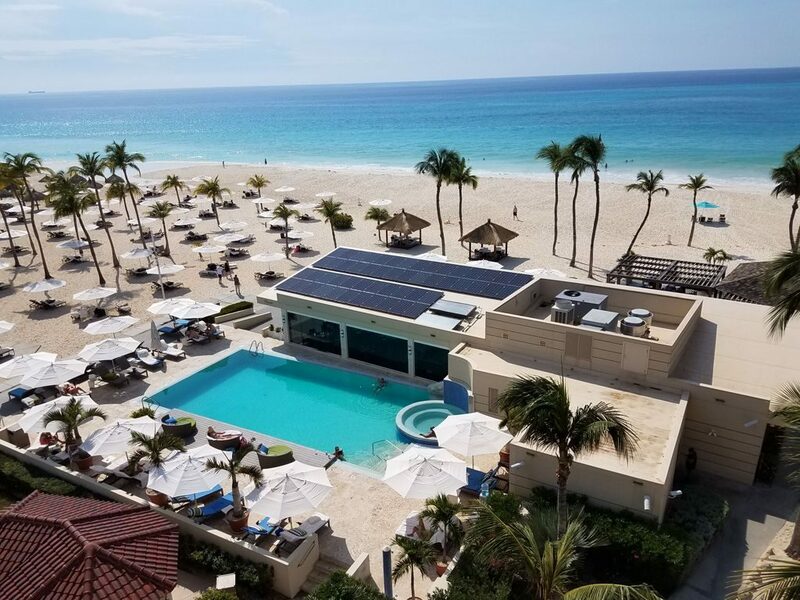 Fun, laid back vibes, relaxation, party, live music, mouth-watering food, daily happy hour, views, the big game, a family-friendly atmosphere, weekly specials that won’t make your wallet cry, and even treats for your best four-legged friend… yes, whatever you may be looking for… Lucy’s Aruba has it. 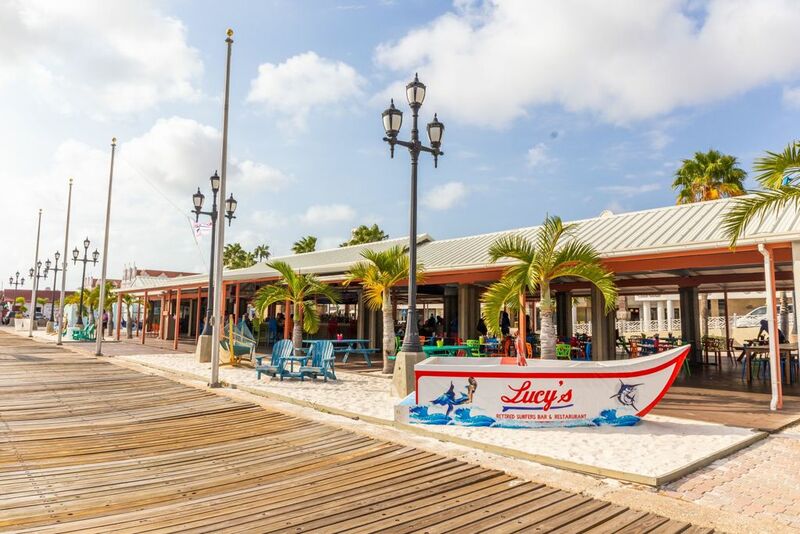 Quite the scene, Lucy’s is situated alongside the dock at the Renaissance Marina (downtown just across from Renaissance Resort Aruba). Consisting of an open-air venue, Lucy’s showcases many bright and colorful accents with plenty of fun and comfy seating areas to plop down on. Sway in a hammock or lounge in one of their beach chairs with a drink in your hand. Yes, life could be worse, am I right?! 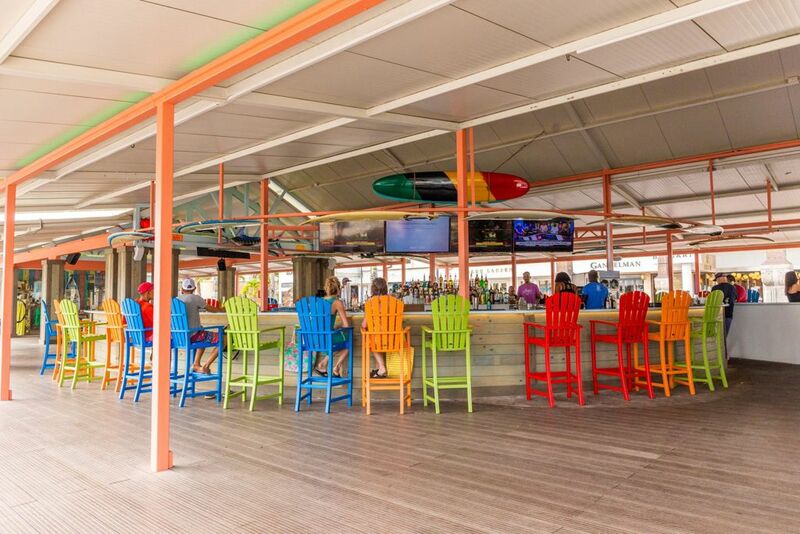 Perhaps you’re more of a sit-at-the-bar type of person, if so, you’re in luck… there are plenty of happy, colorful seats (and smiling bartenders) awaiting your arrival! Thanks to our new friends at Lucy’s my colleague Daniela and I were able to experience this fun place for ourselves! 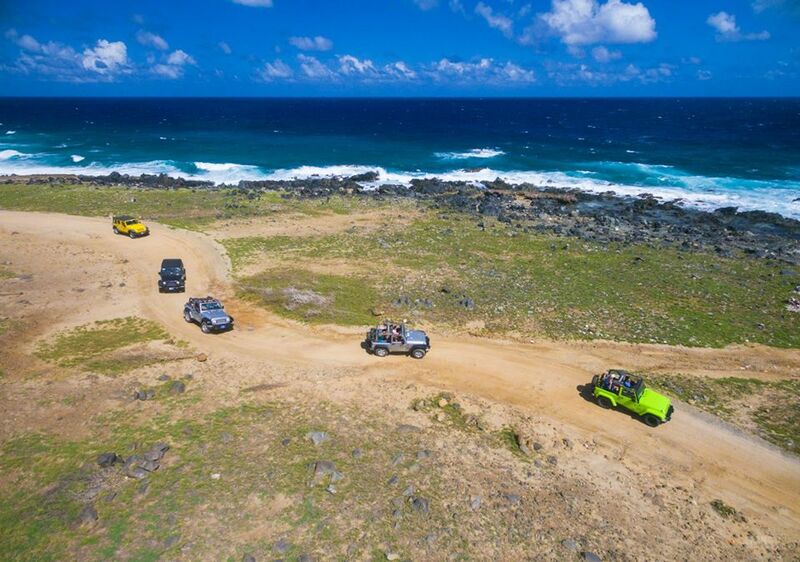 If you haven’t been yet, do yourself a favor and put it on your “must-do list” for next time you’re on the happy island. 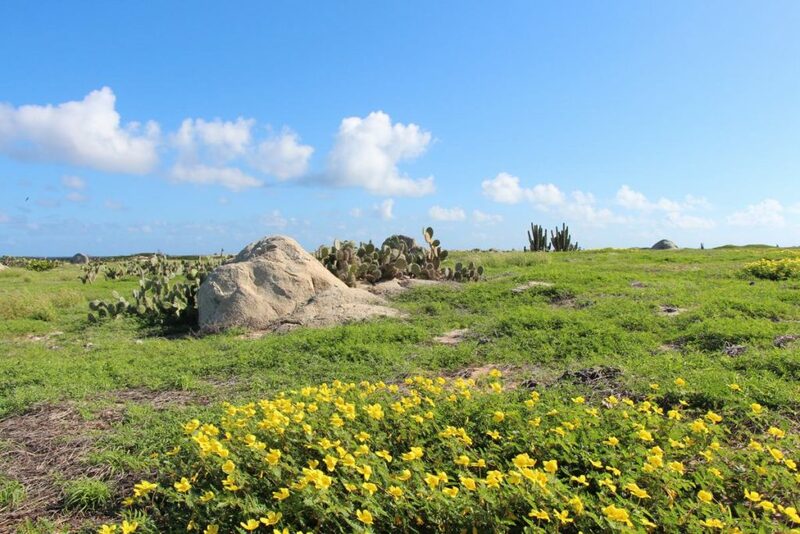 In the meantime, take a look at our review and recap of Lucy’s Aruba! Warning: this may make you hungry and by may I mean it will. This happy place offers a true permanent vacation feel and embodies the song and saying, “don’t worry, be happy”! 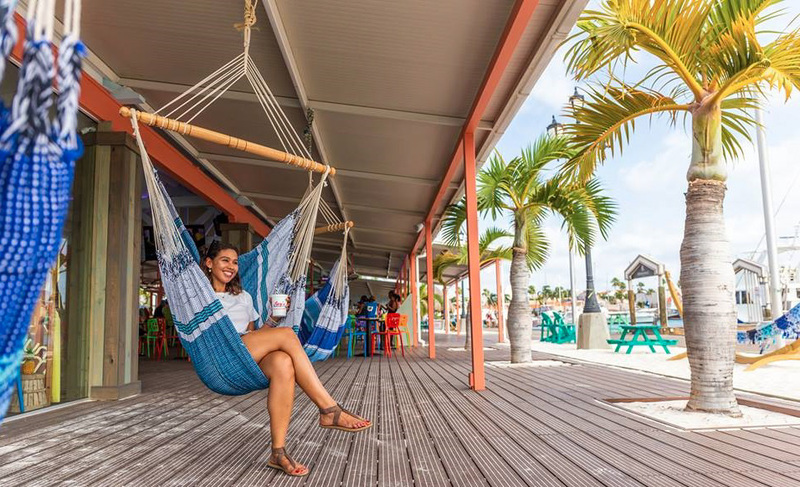 As soon as you arrive all your worries are left at the “door” and you will find nothing but fun, laid back and welcoming island vibes… oh, and delicious food that hits the spot every time! 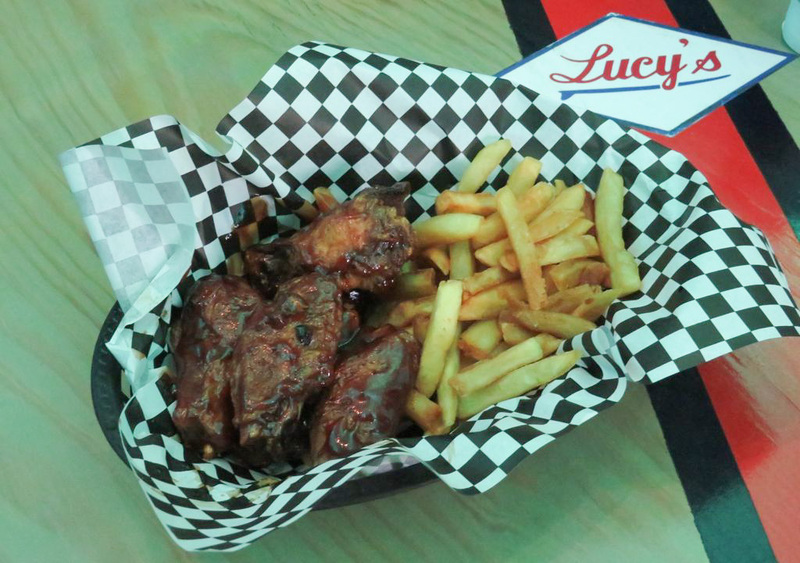 Not only does Lucy’s provide an incredible ambiance but they also share the good vibes by contributing to sustainable and environmentally-friendly efforts. Ditching single-use plastic straws and replacing them with paper straws upon request! 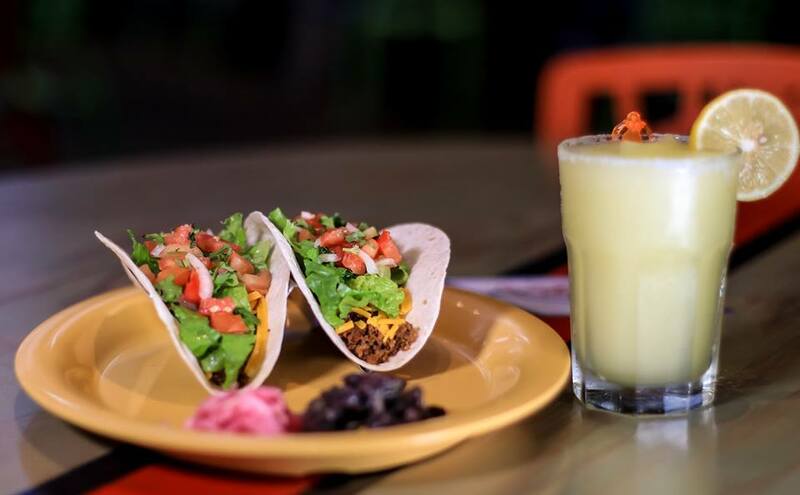 Lucy’s offers a Coastal Fusion menu, to give you a better idea: California meets Southwestern meets Caribbean. With a focus on sustainability many dishes are made with local and seasonal ingredients! As a dedicated foodie, the first thing I observe is the menu and let me tell you their menu (or should I say menus) is extensive. There is something for everyone! 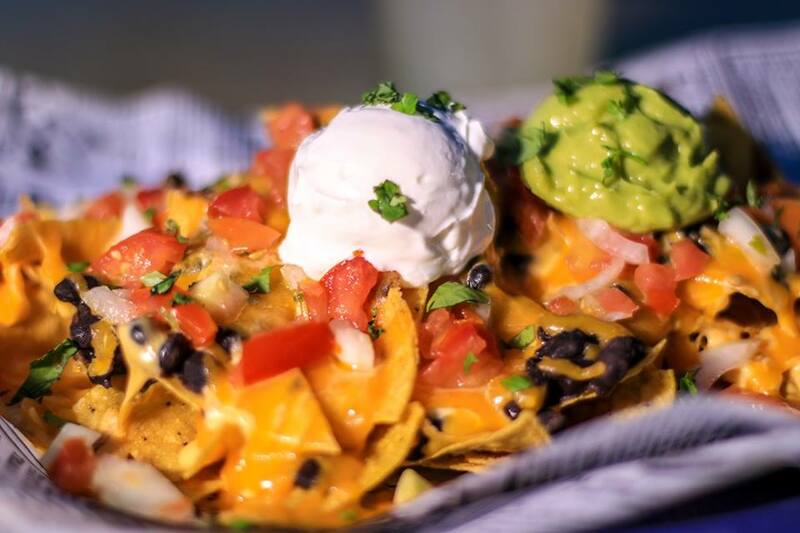 The options are endless… with a vast array of appetizers and snack options, such as their yummy Avocado Fritas, Serious Nachos, Shaka Ceviche, Sue’s Queso Blanco, Rock-A-Mole, and SO much more – all perfect for sharing! The main entrees consist of plentiful seafood dishes, burgers, sandwiches, salads, tacos, surf n’ turf, Jamaican jerked chicken, and more! Aside from the great variety found on their menus, their Late Night Menu really caught my eye. Lucy’s serving food after “regular kitchen hours” is so amazing to me! Barely any restaurants on the island (other than food trucks of course) offer food during later hours. 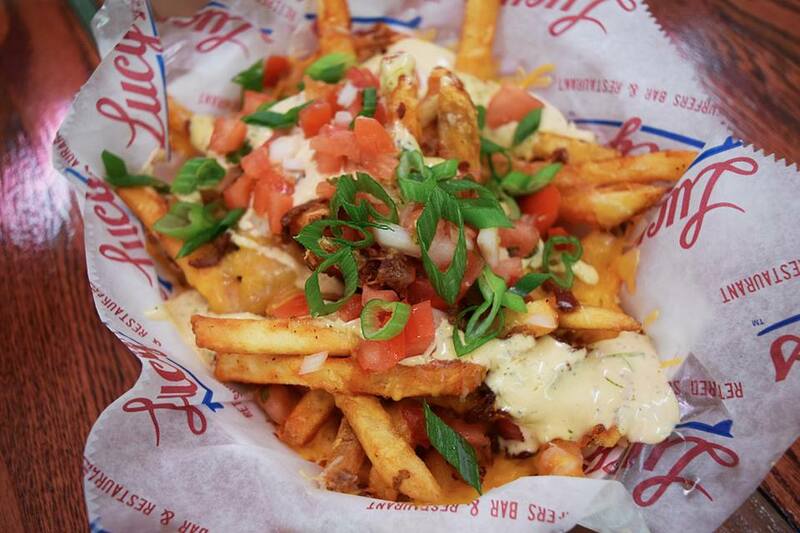 Not only is it super convenient but the menu also offers some seriously delicious bites, including their Surf’s Up Wings (life changing) and Cheese Fries Amigos (how can you say no to cheese fries late night?) Both dishes are not offered on the regular Main Menu so late night is the only way to try these favorites (you’re welcome for that insider tidbit). Fun fact: Do you like to go fishing? 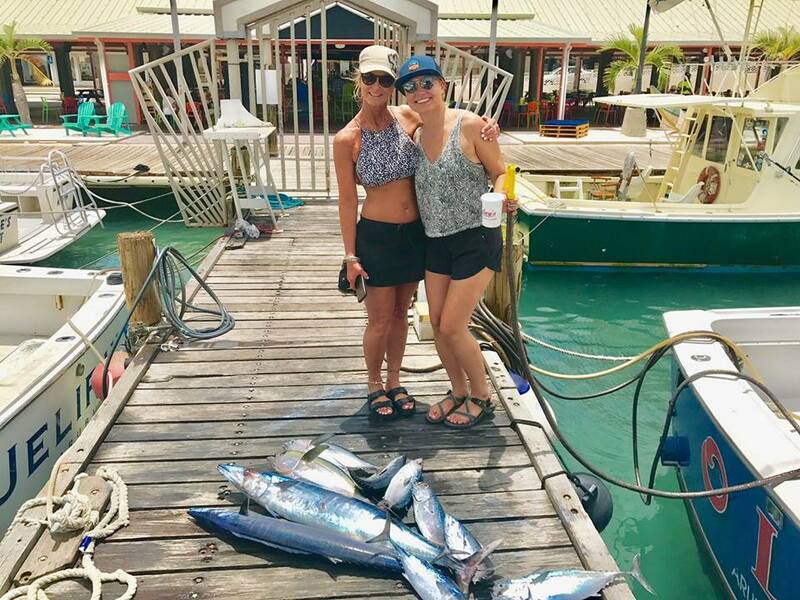 If you’ve planned a day of fishing in Aruba, afterwards be sure to bring your catch straight to Lucy’s and they will cook YOUR very own catch! Choose your style (grilled, blackened or fried) and three sides to go along with it – yum! Talk about a fresh sea-to-table meal! Check out this big catch caught by Lucy’s diners! Sea-to-table dining at its best! Although the food may be the main attraction, it is not the only star of the show! Their Drinks Menu… oh my… let’s just say it’s worth visiting Lucy’s just to try one (or two) of their delicious, fun and oh-so-clever cocktails. I went for Da’ Killer Blue Whale (from what I recall it is strong, blue, delicious and even has a whale in it!) and Daniela went for the Wipeout (let’s just say the drink stays true to its name). Next on the list to try is their Shark Attack, I hear it even comes with a story and presentation. PSA: No marine life was harmed during the making of these cocktails. 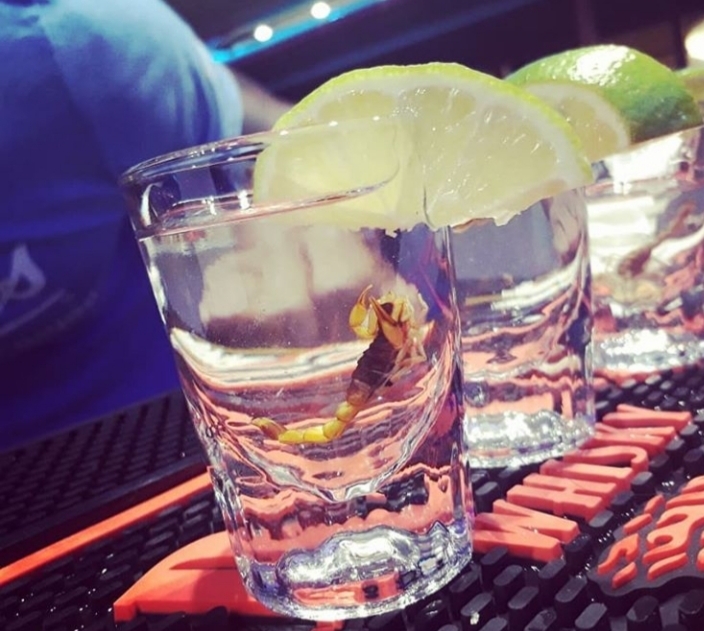 There is one drink that I have not mentioned yet and it would be wrong to leave out because it surely tops them all… that would be their famous Scorpion Shot (yes, it includes a REAL scorpion soaked in tequila and is served at every Lucy’s location!). If you can muster up the strength to take this bad boy then you can take home a Lucy’s t-shirt and some well deserved bragging rights. No we did not build up the confidence to take one ourselves but Manager Sasha is absolutely holding us to this for the next time we visit Lucy’s! I’m already mentally prepping for this one (send help). 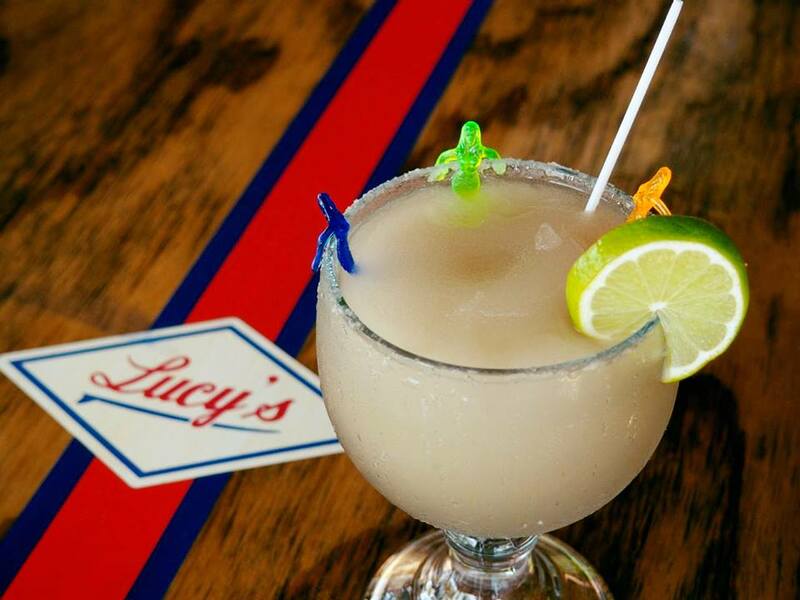 Lucy’s offers a handful of specials and events every week. So that you don’t miss out on any of the fun I’ve listed them for you below! You’ll be back, I promise! Yes… I said it, you will be back. There is too much fun and good food to be had to not come back a second (or third or 10th time)! Thank you to the Lucy’s managers, Sasha and Jenn for the amazing hospitality, as well as to the rest of the super fun and sweet staff for taking such great care of us! We will be back soon and hope to see you there too! 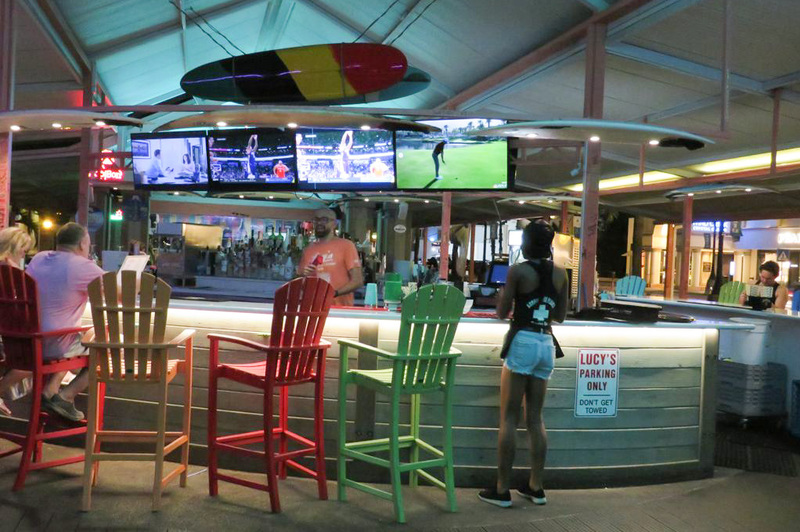 Discover more on Lucy’s Retired Surfers Bar Aruba!